Meadow site in preparation; site of “Fishponds Stage” in centre foreground (the earthworks of the medieval fishponds are in the middle distance on the right). CBMF Bar 2018: 25 beers racked in record time, awaiting their cooling jackets. The interactive version of the music programme for CB2018 is now live on our Midsummer Festival 2018 page, with biographies and photos of all the artists appearing on both stages on June 23rd and 24th. There’s an alphabetical list of who’s on and when; there are links to their websites, Facebook pages, sound recordings and YouTube clips where available, so you can check out the whole fantastic running order and decide who you want to hear. The only problem, as with any good festival, is going to be choosing between stages! If you’d like to print off a hard copy to peruse at your leisure, you can download it here by clicking on the images below (but be aware that it is wider than A4, so you’ll either need an A3 printer, or you’ll have to print it out at a reduced size). Printed programmes should be available in the village and elsewhere by midweek, in time for the Festival weekend. The links to almost all the bands’ webpages and Facebook pages are now live over on our Midsummer Festival 2018 page, so if you want to find out more about a performer, you can go straight to their page (without closing ours down!). Full biogs and photos will follow soon, together with the planned running order and timings. Only a week to go! Can’t wait!!! Bythams Midsummer Festival 2018 wants to hear from YOU! Yes, it’s that time of year again, when we invite musicians and singers to play at Castle Bytham’s free annual music festival over the weekend of 23–24 June 2018. We welcome a broad range of musical styles ­– from bands to solo acoustic performers – and are keen to encourage new and young performers. This unique two-day midsummer event, a highlight of the local music calendar, has an enviable reputation. Featuring musical acts from near and far, it has all the creative energy you would expect from a far larger festival of arts. In the fantastic scenic setting of St Martin’s Meadow (lying at the foot of the Norman castle mound), our large Marquee Stage (fully covered, for performers and a large audience) is now successfully joined within the same arena by an “Acoustic” stage. Full sound rigs, operated by experienced sound engineers, and lighting are provided. The music will alternate between two stages (from approx. 2.00pm–10.30pm on Saturday 23 June* and approx. 11.30am–6.00pm on Sunday 24 June*), with sets lasting 25–60 minutes. 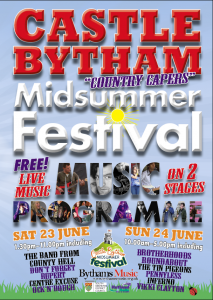 Sunday’s music programme is an integral part of the long-established Castle Bytham Midsummer Fair, with its famous street market and many other entertainments woven throughout the centre of the village. The main Marquee Stage, set within a large marquee and wider outdoor arena, plays to audiences of 400–500 people and can accommodate acts as diverse as big bands and dance troupes, school choirs and rock groups. Providing a more intimate setting, ideal for solo acts, duos or trios, the open-air Acoustic Stage is itself covered. And as in previous years, there may be opportunities for performances at venues elsewhere in the historic village.